In South Africa, the most successful, fun, and exhilarating lottery game ever created is Pick 3. The concept of this game is very simple and it is amazingly fun to play. That’s why it is the favourite of millions in South Africa. People also love to play this game because it can be played daily. It is only off on Christmas day. The joy of a person is unmatchable when such player picks a number from somewhere else and after reaching home finds the same number as the winning number. Some people just try their luck blindly and some apply complete maths and choose the numbers with a strategy so that their chance of winning increases. There are several thousands of South African people who play this fun game every day. Participants are presented three (3) fields in a specific board and then they choose three numbers between 0 to 9. Pick 3 – How To Play? The participants are offered various bet amounts from which they can choose the one which suits them best. The money they can bet is R3, R5, R10 and/or R20. All these prices are inclusive of VAT. Then the participants are given the options to choose the type of bets they want to play, such as straight, 3-way mix, 6-way mix, front pair, split pair, or back pair. If the complete ticket cost of a bet is more than R700 in a single bet, then it gets rejected. If on the bet slip, participant makes a mistake, then the participant should mark “Cancel Board” box so that the next bet slip or board can have a new selection. Then the retailer processes the bet slip through the terminal and issues a relevant valid slip/receipt through that same terminal. The retailer can also enter the selections manually and generate the relevant valid slip/receipt from same terminal. The participant should make sure that the entry is registered on the central computer system otherwise the entry won’t be considered a valid entry. And also note that in Pick 3, combination bets are not supported. 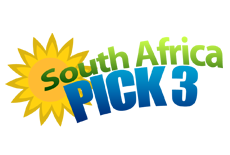 How Can One Participate In Pick 3 Played In South Africa? The participant can provide details to retailer which the retailer further enters manually into the system. The details which can be provided include the bet amount, type of bet and the no. of draws which should be played. In a single bet slip, a participant can bet for 7 consecutive draws. The draw of Pick 3 take place at 8 pm everyday (as it is told above also, Christmas remains off) and the sale of receipts of Pick 3 closes at 7:30 pm each day. The organizers maintain complete transparency and the draws are conducted according to the procedures that are followed from time to time. There are thousands of players in South Africa who play Pick 3 every day but they simply pick a straight set of numbers and become one of those whose chances to win are 1 in 1000. There are many lotto systems who guarantees win in the game Pick 3 but their viability is not proved yet. There are some concepts which they use to follow and ensure that their system will pick the winning number on the basis of those concepts. Some common concepts are Box bets and unmatched numbers. The truth is that there is no way to cheat the lottery. These systems might sometime turn the odds in favour of the player. Here, the person should understand that he/she is playing two lotteries at a time because when the system is also unable to provide the winning number every time, it also means trying the luck. There is a unique thing in Pick 3 game of South Africa, Liability Limit. Suppose that the total prize money for one draw of the game is R15 million. To maximize the chances of winning, the central computer accepts only a limited number of entries for any combination of 3 numbers. When the number of entries are completed, the central computer stops accepting more bids. The extra bids are rejected and returned. The terminal at the retailer’s end will display the message that the combination has reached maximum limit. This is done so that more prize money can be given to participants. Suppose that one three-digit combination which is chosen by many participants is the winning combination. Then, to distribute prizes to extra participants will disbalance the whole procedure. Secondly, if all the winning (including the extras) participants are given the prize money, the authority may go for lowering down the prize amount of every winner. This will further decrease the charm of the game and people will not participate in Pick 3 as they take part in the game now.